About 100 people joined Denis and Chris McConnell, co-owners of noted seating supplier McConnell Seats, to celebrate its 60th anniversary at Melbourne’s Royal Brighton Yacht Club last Thursday night. It was a special occasion for the McConnells who were joined by other family members, several key staff, their clients and industry supporters for a night of memories, good cheer and some opera. McConnell CEO Alan Smith emceed the event. Smith says it was a hard decision made with Denis McConnell to proceed with an industry celebration. "But it became quite clear we had a story to tell," Smith says. "Given the dramatic changes that are happening in manufacturing across Australia, it’s an appropriate time to tell our story spanning 60 years." The night was quite a milestone for the McConnell family and the Australian bus industry, given McConnell Seats’ status as the oldest continuous component supplier to the Australian bus industry. "We’ve had one owner, one business, one name for 60 years," Smith says. Denis McConnell has been attached to the business for all of the company’s 60 years, starting as a school boy, sweeping the factory floor after school as a ten year old, and then into an apprenticeship when he turned 13. He acknowledged his late father James, the founder, as a hard task master who "taught me well", inspiring a passion which has endured for all of those 60 years. After Denis finished his five year apprenticeship, he developed an interest in seat design, a side of the business he still enjoys today. With CEO Alan Smith joining the company a decade ago, Denis says he is able to enjoy other passions, including snow skiing and sailing, and spending more time with wife Chris and family. McConnell addressed the crowd expressing appreciate of the loyalty of his staff and customers. "A business can only succeed if there is a dedicated group of people involved," he says. "We would like to thank our staff for their loyalty and input. Without your support we would not have achieved the success we have today," he says. "It’s my wish that McConnells continues into the future and be the premier seat supplier of Australia." And, most importantly, McConnell thanked his wife Chris who had supported him over the past 45 years. 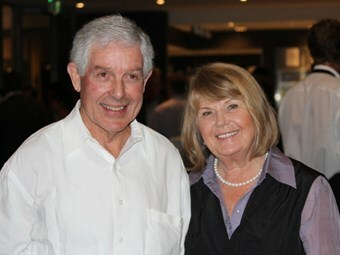 Among the guests at the 60th celebration was Volgren Marketing Director Tony Kerr, who wished the McConnells well. "Volgren has had a very good long term relationship with McConnells – it goes way back to the inception of both the McConnell and Grenda companies and has followed on through a lot of ebbs and flows over the time," Kerr says. "The two companies have a lot of mutual respect, and a lot of commonality about how they do business, so I think it’s a good strategic fit and that carries on with the business today." Kerr says while it’s up to Volgren’s customers to decide which seating manufacturer they would prefer to use for bus fit-outs, the vast majority use McConnell. "The McConnell product suits the Volgren product – there’s a lot of synergies – and the customers are happy." And while there was no birthday cake, the many well-wishers were left mesmerised with an operatic performance from the trio ‘Tenors Under Cover’, hamming up, then singing an operatic ode to mark sixty years of seat manufacturing, leaving Denis and Chris McConnell with a night to remember.